Students who commenced the Bachelor of Arts in Communication (Social Inquiry) Bachelor of Arts in International Studies before 2016 can view their course program at Course transition arrangements. The course combines a professional degree with immersion in another language and culture, enhancing professional training and career options. This combined degree seeks to augment the value of social and political sciences by broadening awareness and understanding of another language and culture. Social and political sciences come to life in the contemporary world through communication – inter-personal and with the community, and more widely in society and the global public sphere. This cross-disciplinary course investigates society, explores current issues, and questions implications of change and progress in the global community. Students undertake professional studies as well as social, cultural and communication theory and practice so they can ask questions, research issues, develop advocacy skills and develop effective communication strategies. Combining social, political, historical and philosophical perspectives on how societies work, the course provides students with practical skills in qualitative and quantitative social research methods. Students learn how to understand social issues, think through ways of making a difference, and research, communicate and plan contributions to national and international debates. The course equips students with the knowledge and skills to be involved in diverse organisations engaging with social change. Career options include advocacy in environmental, Indigenous, human rights and overseas development organisations, as well as trade unions; policy research, analysis and program management in government; management in social services and welfare, including women's, migrant and Indigenous programs; and research in think tanks and academia. There are no prior language requirements for the international studies program. Entry level to the various language and culture programs depends upon students' prior knowledge of the relevant language. Students are admitted to the international studies program with no guarantee of entry to a specific major, although every effort is made to meet students' preferences. Successful completion of the Insearch Diploma of Communication (DC) with a WAM of at least 70 per cent guarantees international students entry into this course with one year of recognition of prior learning. There are no prior language requirements for the international studies program. Ngee Ann Polytechnic, Singapore: Diploma in Mass Communication. The course is offered on a five-year, full-time basis. Students spend two sessions of study at a university or other higher education institution in the country of their major. Students must complete 240 credit points consisting of 24 credit points of core subjects, a 48-credit-point major and potential 48-credit-point second major (subject to application), 24 credit points of cross-disciplinary electives and a 96-credit-point country major choice. Students who do not meet the requirements to study the second major complete elective subjects. Students spend their fourth year of study at a university overseas. All subjects provide students with practical research skills that are applied in real-world settings. The final three subjects are project-based, allowing students to work on topical issues and be placed with a community, corporate or government organisation, or within NSW Parliament. Students can also elect to undertake a professional internship in industry. A typical course program is shown below for students commencing in Autumn session with the Germany major as the chosen international studies major. 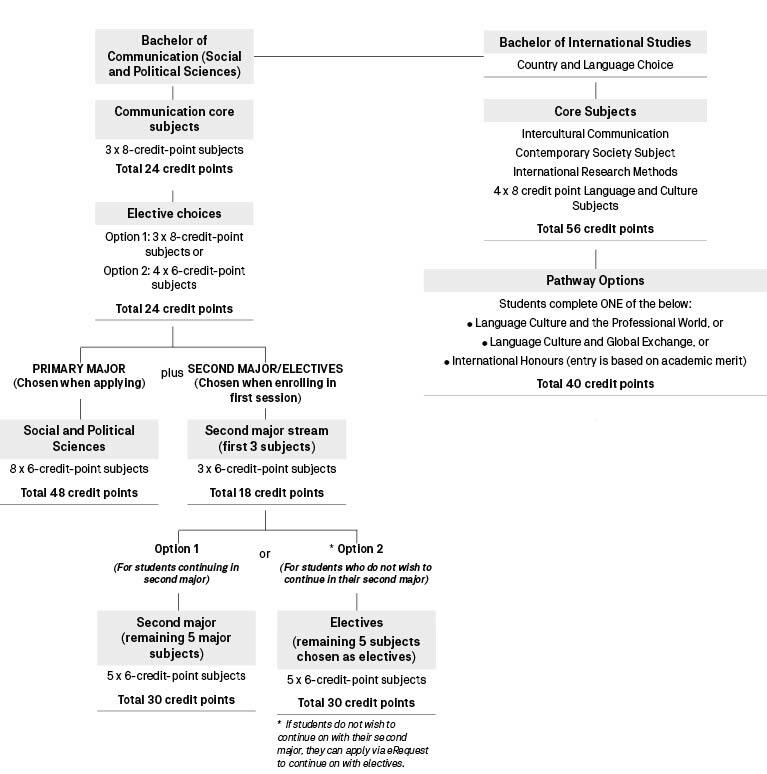 Other countries may be chosen from the list of majors in CBK90005; the program has the same structure but with subjects specific to the chosen country major. All students choose a second major stream when enrolling in their first session. This 16-credit-point stream consists of two major subjects from another major. Students can choose any second major (excluding Media Arts and Production) and, subject to meeting criteria, they can apply to continue with their chosen second major (the remaining 32 credit points, i.e. another four subjects). Students who choose not to continue with their second major choice or who do not meet the eligibility criteria, continue in their course by choosing 32 credit points of electives (i.e. four subjects). The Bachelor of Communication (Honours) (C09047) is available with an additional year of full-time study for eligible students.